With growth slowing down, the price/earnings multiple could contract even lower. This being said I believe Wal-Mart is an excellent business, as it always investing in innovation that helps control inventory and focus on certain types of merchandise that offsets weaker demand in recessions. Despite the expected slow down in consumer spending, Wal Mart is well positioned with its diverse product mix of consumer staples and foods that it is offering on its shelves. It has lower prices in comparison to its competitors, which could drive more traffic for the retailer. Just like Walgreen (WAG), Wal-Mart Stores expects to slow down on the rate of opening new stores and instead would try to focus on developing the profitability of existing locations, without cannibalizing sales in its existing outlets. The lower capital spending has freed up enough cash flow to fund the company's agressive share buyback program. A potential growth area for the company are its international operations, where selling space has increased by more than 40% since 2006. Wal-Mart (WMT) currently has 267 locations in China, operating under Wal-Mart or Trust Mart’s names. The company had 3615 international locations at the end of 2008. There is still room for growth in Chinese operations, fueled by the increase in number of middle-class families in the country. For Wal-Mart, China represents the biggest frontier since it conquered America. China's voracious consumers are pushing retail sales to a 15 percent annual growth rate; that market will hit $860 billion by 2009, according to Bain & Co. (source). Currently Wal-Mart Stores is trading at 13.40 times earnings, yields 2.40% and has an adequately covered dividend payment. The company does spend a lot of its cash flow on stock buybacks, which could prove beneficial in the long run since it could provide above average dividend growth over time for the same effort. I recently analyzed the annual report of spirits maker Brown Forman (BF-B), which is one of the newest additions to the S&P Dividend Aristocrats index. I was amazed to learn that some of its top selling products were Jack Daniel’s Tennessee Whiskey and Finlandia. It is very intriguing how the company has been able to leverage the brand name of its top selling products by cutting costs to the bone and increasing efficiencies, while at the same time expanding sales internationally. This had translated into growth in earnings per share, which also fueled a 9.8% average annual growth in dividends over the past decade. The similarities between Brown-Forman (BF-B) and other prominent dividend aristocrats do not end here. Most elite dividend stocks are household names, whose products and services are available to consumers and businesses worldwide. They are easily recognizable names for which consumers are willing to pay a premium in order to enjoy them. The strong brand name provides a good differentiation strategy versus competitors, which ensures that the company is able to charge a premium for its products and have an enduring wide-moat business. Other companies with strong brands which have been able to provide a growing stream of dividends include Procter & Gamble (PG), McDonald’s (MCD), Altria Group (MO), Coca Cola (KO) and Abbott Laboratories (ABT). The Procter & Gamble Company (PG) engages in the manufacture and sale of consumer goods worldwide. The company operates in three global business units (GBUs): Beauty, Health and Well-Being, and Household Care. The company has rewarded stockholders with dividend increases for 54 consecutive years. 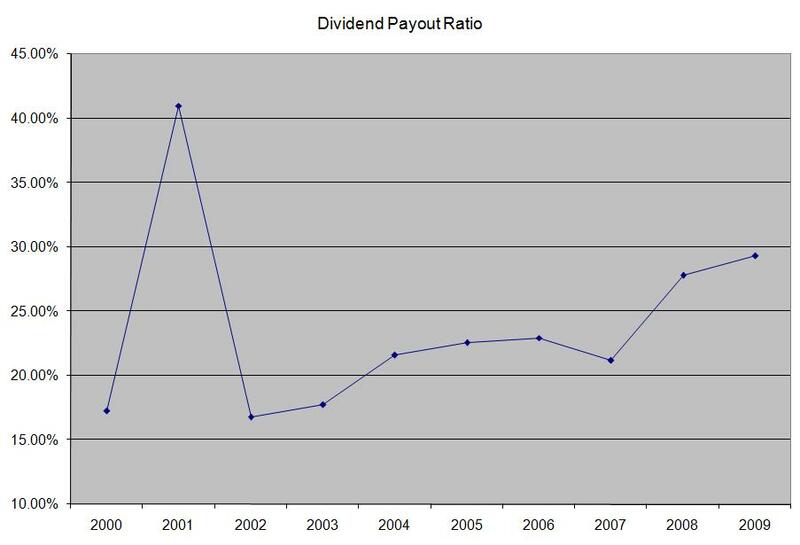 Annual dividends have increased by an average of 10.70% annually over the past decade. The stock currently yields 3.10%. Check my analysis of the stock. Altria Group, Inc., (MO) through its subsidiaries, engages in the manufacture and sale of cigarettes and other tobacco products in the United States. Philip Morris International Inc (PM) on the other hand manufactures and sells cigarettes and other tobacco products in markets outside of the United States of America. Before spinning off Kraft (KFT) and Philip Morris International (PM), Altria had an uninterrupted streak of 41 consecutive annual dividend increases. The spun out companies are also likely to return increasing amounts of profits back to shareholders in the form of share buybacks and dividend increases. I like both MO and PM for global exposure to tobacco. The stock currently yields 6.60%. Check my analysis of both stocks. McDonald’s Corporation (MCD), together with its subsidiaries, franchises and operates McDonald’s restaurants in the food service industry worldwide. Its restaurants offer various food items, soft drinks, and coffee and other beverages. The golden arches has raised dividends for 33 years. 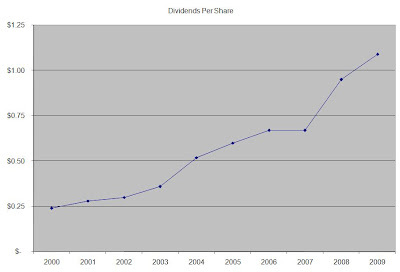 Annual dividends have increased by an average of 26.20% annually over the past decade. The stock currently yields 3.10%. Check my analysis of the stock. The Coca-Cola Company (KO) manufactures, distributes, and markets nonalcoholic beverage concentrates and syrups worldwide. It principally offers sparkling and still beverages. The company has increased distributions for 48 consecutive years. 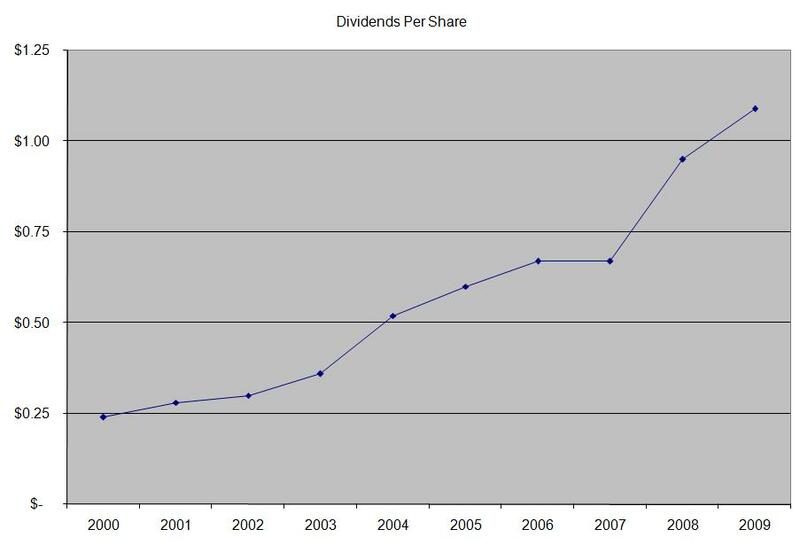 Annual dividends have increased by an average of 10% annually over the past decade. The stock currently yields 3.40%. Check my analysis of the stock. Abbott Laboratories (ABT), which manufactures and sells health care products worldwide, has raised dividends for 38 consecutive years. Annual dividends have increased by an average of 8.80% annually over the past decade. The stock currently yields 3.70%. Check my analysis of Abbott Laboratories (ABT). Just because a company owns a strong brand, investors shouldn’t simply rush in to purchase the stock. Overpaying for future earnings is likely to cause diminished returns over time. That’s why having a strict entry criteria and requiring at least a decade of consistent earnings and dividend growth should weed out the fads from the trends. This article was included in the Carnival of Personal Finance # 268. At the same time company has managed to deliver an impressive 8.40% average annual increase in its EPS over the past nine years. Analysts expect EPS to increase to $2.60 in FY 2010, followed by an increase to $2.95 in FY 2011. Increases in sales will be driven by expanding the current store count by 2%, as well as increasing same store sales as price conscious consumers purchase the company's value-priced assortment of everyday necessities. The once cash-only stores now accept PIN-based debit card payments in most locations. Food stamp and credit card acceptance is also being rolled out. The company has benefited from the recent financial crisis, as some middle-class consumers have traded down to its store locations for everyday items. Family Dollar also drives traffic through limited time offerings as well as stocking up on treasure hunt items which creates customer excitement. FDO is attractively valued with its low price/earnings multiple of 16.30. The current dividend yield of 1.60% however is low for my taste. I would consider adding a partial position on dips below $31. Dividends have historically contributed about 40% of common stocks annual average returns. 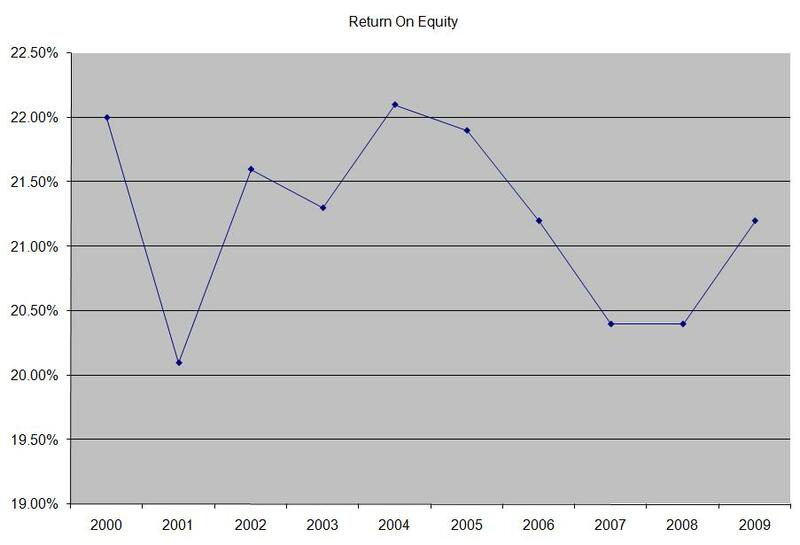 Reinvested dividends however have contributed almost 97% of S&P 500 total returns since 1871. Add to that the fact that retirees are looking for a better way to generate income than the low rates on bank deposits. 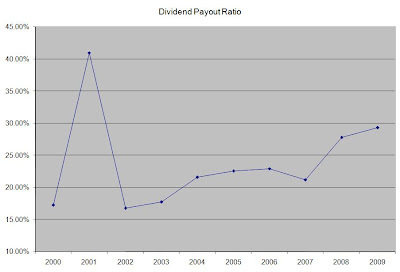 Thus it is no surprise that investors’ interest in dividend investing is increasing. Two differing paths are presented to aspiring dividend investors. One path is to do it on your own. Another path is to trust the experience of an investment professional and invest in dividend funds or dividend etfs. In this article I would compare and contrast the two methods and also outline some of the most widely held alternatives for both scenarios. The main advantages of dividend funds are the instant diversification that investors achieve, since many of them hold a large basket of securities. It might also be cheaper to purchase one ETF than purchasing 30 or 40 individual securities. Another advantage of holding dividend etf’s is the time saved in research or portfolio rebalancing. This benefit of dividend ETF’s is especially important for busy investors. One disadvantage of dividend etfs is that they might follow an index or a strategy which is too slow to react to changes in the companies owned. For example, the companies which are members of the S&P High Yield Dividend Aristocrats index (SDY) are added or removed once an year. This means that a company like General Electric (GE), which cut dividends in February 2009 stayed in the index until December 2009. Most income investors would have disposed of the stock immediately after the dividend announcement. Another disadvantage might be that these dividend indexes could be constructed and ran on autopilot. One recent example is dividend indexes which overweigh companies with a higher yield, without taking into consideration the sustainability of the dividend payment. Because of this many dividend etf’s were overweight financial stocks such as Bank of America (BAC) or Fifth-Third Bank (FITB) before they had cut dividends substantially. This added further pain to the ETF’s already depressed share prices. 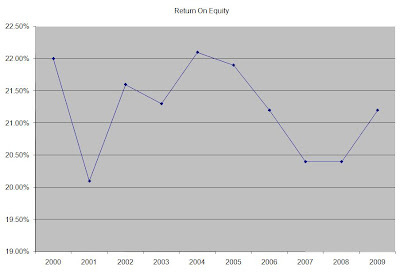 A third disadvantage of dividend funds is annual management fees. Because they typically have smaller asset bases, and because they are more actively managed than regular index funds, investors pay between 0.40% for iShares Dow Jones Select Dividend Index ETF (DVY) and 0.60 % for the The PowerShares Dividend Achievers ETF (PFM). This could detract from long-term performance and could prove costly in the long run. Another disadvantage is the fact that investors would be subject to excessive turnover within their etf portfolios. Many indexes such as the dividend achievers for example have a small but consistent turnover which might detract from long term performance. The ETF currently has 212 holdings. The top 10 holdings account for almost 46% of the total portfolio. Thus, by purchasing the ETF, dividend investors are being charged an annual management fee, are subject to large annual holdings turnover and essentially hold a portfolio which is not as diversified as it looks initially. If you simply purchased stock in large cap companies such as Wal-Mart (WMT), Procter & Gamble (PG), Johnson & Johnson (JNJ), Chevron-Texaco (CVX), PepsiCo (PEP) and others, investors could benefit from dividend investing, without having to pay fees each year for the privilege of being an income investor. If instead investors focus on building their portfolios, they could pay little or no commissions, they could adjust portfolio weights any way they want and could invest not only in the large cap stocks but also in small but promising dividend growth stocks.